OUTER BANKS, NC (Mark Price/The Charlotte Observer) - It may feel a bit early for the beach, but that hasn’t stopped a Portuguese man-of-war from coming ashore on North Carolina’s Outer Banks. Cape Lookout National Seashore posted an early warning Monday, noting “the first of the season” had washed up at the North Core Banks. 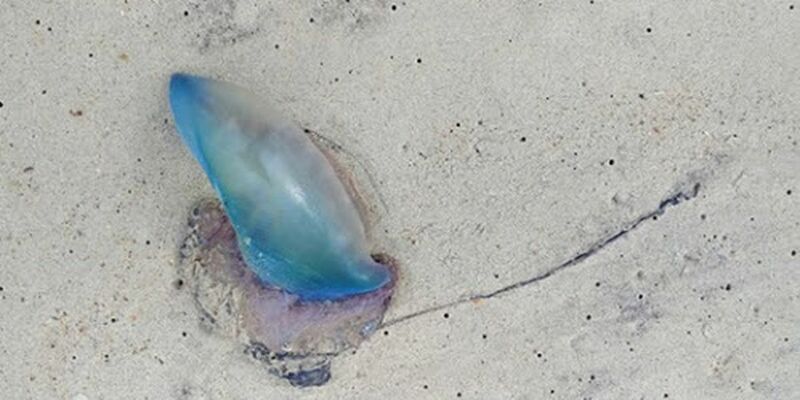 Park officials shared a photo of the man-of-war, showing a tendril trailing in the sand, with a capability to sting anyone who stepped on it. “Use caution! Even when they appear ‘dead,’ the stinging cells in their tentacles can still pack a punch!” Cape Lookout National Seashore officials wrote on Facebook. Winds have played havoc with the Outer Banks beaches in recent days, including carving unusually large sand pedestals on North Core Banks, The Charlotte Observer reported. Cape Lookout park officials said they believe the man-of-war came ashore with the help of south and east winds associated with weather fronts. Portuguese men-of-war are known for terrorizing beach goers, both on the sand and in the waters off the Carolinas. Men-of-war have tentacles that average 30 feet in length, but have been known to grow to 165 feet long, reports National Geographic.